As part of our programme in Ethiopia, NIMD today signed a Memorandum of Understanding (MoU) – a type of framework agreement outlining the general terms and objectives of our collaboration – with the National Electoral Board of Ethiopia (NEBE). NEBE is an autonomous government agency which supervises and monitors Ethiopia’s elections and is responsible for the registration and oversight of political parties. The new MOU will allow NIMD to support the board in fulfilling these roles effectively and transparently. In addition, NIMD will work on capacity building and dialogue with political parties in Ethiopia. This will be added to the capacity building activities we are currently undertaking with the House of Peoples’ Representatives and the Oromia Regional State Parliament. The overall objective of NIMD’s Ethiopia programme, which was launched in January 2017, is to contribute to the consolidation of democracy in the country. Our work with political parties will be crucial to this. By helping to facilitate ongoing dialogue between the ruling EPRDF and opposition parties, we hope to contribute to the strengthening of understanding and trust between these parties and create an environment for constructive cooperation among them. The signing of the MOU was possible following initial meetings between NIMD representatives and NEBE in Addis Ababa, and a study visit of NEBE board members and secretariat to the Netherlands on the occasion of the Dutch municipal elections on 21 March 2018. To enable a swift start of the partnership, the NEBE Chair Ambassador Zekaria already signed the agreement in Addis Ababa. 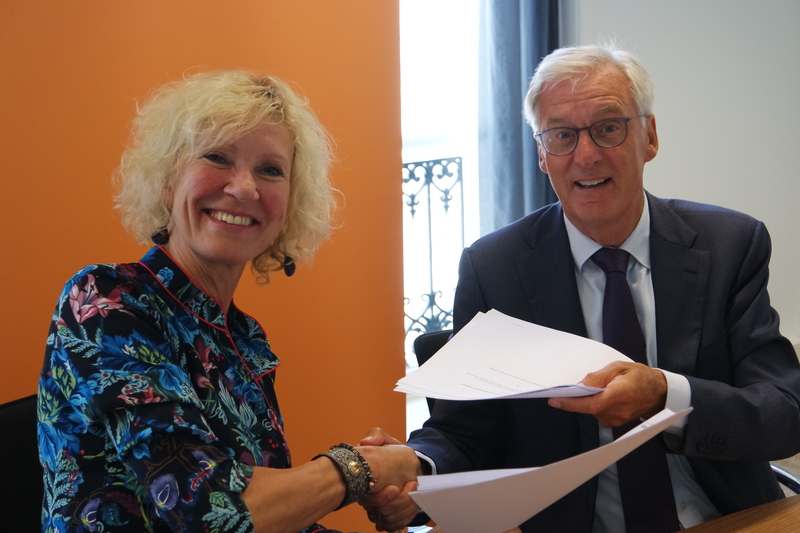 For NIMD, the MOU was signed by the Executive Director Simone Filippini and co-signed by the Dutch Senator and former State Secretary for Foreign Affairs Ben Knapen, in his capacity as advisor to the NIMD Ethiopia programme. We are proud to be able to provide support to NEBE in their work and are looking forward to a long and fruitful working relationship.